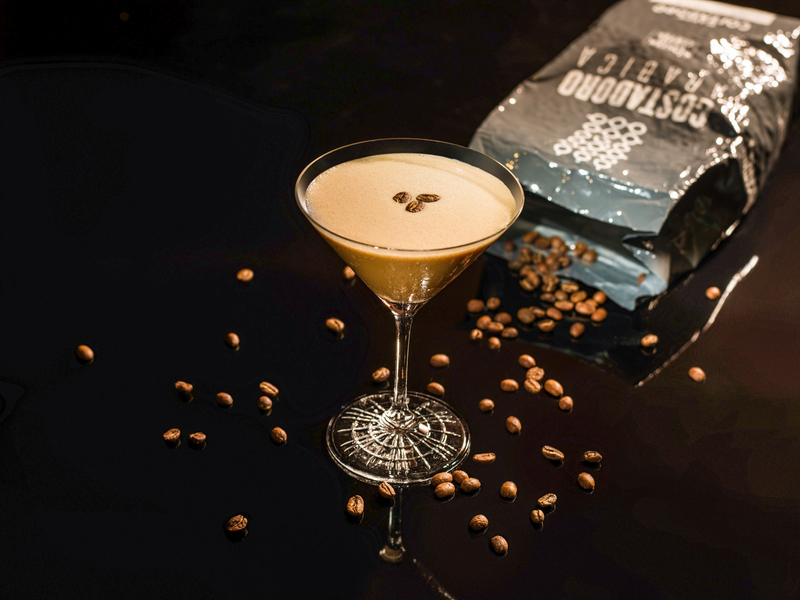 These are not your typical espresso martinis, folks. Inspired by a recent visit to my Chope Shanghai compatriots that involved several coffee-based alcoholic beverages, as well as my general predisposition for all things coffee and alcohol, I decided to take it upon myself to find the most innovative caffeinated cocktails across Asia. While a shot of whisky in your afternoon long black is a quick ‘n dirty instant fix (not that I’ve ever done that), I suggest you instead visit any of these renowned spots to experience a creative coffee cocktail mixed to perfection – at a more socially acceptable hour of course. Let’s start right in our own backyard – we all know that the team at Jigger and Pony crafts a killer cocktail, but The Liberties truly exceeded my high expectations. As you take the first sip an arresting aroma of roasted chocolate makes it difficult not to dive right into the mix of Teeling small batch Irish whisky, coconut cold brew coffee, pandan bitters, and the source of the heavenly smell: a garnish of roasted chocolate nibs. The taste is impeccably smooth with only the faintest hint of coconut complementing the full-bodied flavour combo of Irish whisky and cold brew. It’s like the rich, sophisticated aunt of a Black Russian who you’ll want to visit again and again. What do you get when you cross one of the best craft beer breweries in China with one of the most innovative coffee bars in Asia? Cue up Californication, a combination of Boxing Cat Brewery amber ale that’s brewed with Ocean Grounds’ Santa Leticia Bourbon Especial cold drip coffee. The 14-hour brewed cold drip has hints of palm sugar, tootsie roll, and nougat, thus the the resulting beer that’s been brewed WITH the coffee is crisp with notes of caramel – a heady experience that warrants several rounds. What surprises me most is that coffee beers tend to be in the stout or porter families, but this light and refreshing amber ale brew pushes boundaries in new and delicious directions. Olfactory Bulb Cafe specialises in coffee, tea, and chocolate-based cocktails (when can I move in? ), so choosing just one from their extensive menu proved a bit challenging. One look at “Nutella milk” however, and I was sold. The Golden Eclipse contains Mount Gay Barbados Rum, Frangelico, chocolate bitters, espresso, and house-made Nutella milk. It’s a nutty, sweet, hazelnut-mocha-like reason to drink alcohol that warms like a nice cuppa hot cocoa, with a grown-up twist. Forget an alarm clock, take a swig of the Reviver at Manhattan (which was recently named Asia’s best bar and 11th best in the WORLD) and you’ll be feeling all kinds of alive. Daron calvados (apple brandy), Carpano Antica Formula vermouth, Ferrand Dry orange curaçao, sugar, bitters, cloves, jalapeno, and coffee beans are all soaked together overnight to make this complex drink. Spicy, bold, and strong, this is a cocktail fit for one of the top bars on the planet. Book a table at Manhattan. It’s no secret that I’m a sucker for a good espresso martini, but The Artisan Room’s updated version on the classic reinvents the wheel in all the right ways without straying too far from a formula proven to work. They specialise in coffee and tea cocktails, so rest assured there is skill, passion, and experience behind this badass tipple. Instead of coffee liqueur, vodka, and espresso (a typical espresso martini), the Costadoro Martini is created with dark rum, Costadoro espresso, Bailey’s, coconut milk, and Okinawa black sugar. The heavier coconut milk and dark sugar result in an exceptionally smooth martini laced with hints of hazelnut and toasted bread from the the Italian coffee exclusive to Artisan Room. Pair that with an al fresco garden area and I think that’s the sound of me packing my bags for Hong Kong. This hip Bangkok speakeasy is so secret that there isn’t even a photo of the elusive coffee cocktail – but something as delicious and unique as a coffee negroni deserves a spot on the list. Hidden behind a nondescript green door in Asok, Q&A has become somewhat of a cult hit for cocktail lovers in Bangkok. With equal parts gin, vermouth, and campari, this negroni mixture brews for six hours with Ethiopian coffee beans resulting in a sultry combination of flavours that fit perfectly with the intimate interior of the bar. The depth and nuttiness of the coffee mellows out some of the bitterness you’d expect from a negroni, which basically means it’s the negroni I’ve always wanted. Ask about their cold brew version as well! One of the fruitier options on the list, Gibson goes for a refined simplicity with Prohibition. They mix Cutty Sark Prohibition whisky, grapefruit & orange campari, and Antica Formula (sweet vermouth), with cold brew ice cubes, then garnish with grapefruit zest and gold leaf – ‘cause Gibson is that badass. Think a more robust Manhattan that becomes increasingly smooth as the cold brew ice gradually melts and infuses the drink with the dark and chocolatey notes of the coffee. Book a table at Gibson.